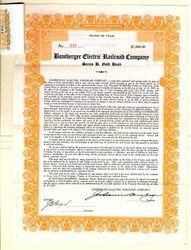 Beautifully engraved uncancelled certificate from the Bamberger Electric Railroad Company. This historic document has an ornate border around it with a vignette of the Company's name. This item has the signatures of the Company’s President, Julian M. Bamberger and Secretary, J. B. Bean and is over 83 years old. Coupons attached on top. The Bamberger Electric Railroad (originally known as the Salt Lake & Ogden Railway, but changed its name in 1917) began operations in 1908 although the system dated back to the Great Salt Lake & Hot Springs Railway of the 1890s. At its peak the system connected Ogden and Salt Lake City on a line that was built to very high standards. It was electrified soon after its 1908 opening and carried heavy freight and passenger traffic during its early years. The depression was unkind to the system and it fell into bankruptcy in 1933 emerging as the Bamberger Railroad in 1939. In 1957 the system was sold to investors, which sold portions of the line to Union Pacific and Denver & Rio Grande Western in 1958.